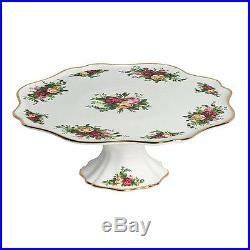 A Beautiful Footed or Pedestal Cake Plate in the Old Country Roses pattern by Royal Albert. This Lovely Cake Plate features white fine bone china decorated with richly colored burgundy red, pink and yellow roses, trimmed in gold. 12 1/4" in length, 4 1/4" high and is Brand New, Never Used, FIRST Quality and comes in the Original Royal Albert Box. Cake Stand is Mint, box may show moderate shelf wear. A nice piece to add to your Collection! The item "Royal Albert OLD COUNTRY ROSES Pedestal / Footed Cake Plate Stand NEW / BOX" is in sale since Friday, January 4, 2019. This item is in the category "Pottery & Glass\Pottery & China\China & Dinnerware\Royal Albert". The seller is "islandgirl2246" and is located in Bloomfield, New Jersey. This item can be shipped to United States, Canada, United Kingdom, Denmark, Finland, Malta, Australia, Portugal, Japan, Sweden, South Korea, Belgium, France, Ireland, Spain, Italy, Germany, Austria, Mexico, New Zealand, Switzerland, Norway, Brazil, Chile, Colombia, Bermuda, Bolivia, Ecuador, French guiana, Guernsey, Gibraltar, Iceland, Jersey, Liechtenstein, Luxembourg, Monaco, Peru, Paraguay.